To work around a bug in xelatex I have to compile a tree in pdflatex. This works nicely with English words but I need Chinese words for the Chinese version. But whatever I tried was giving error messages that are uninterpretable for me. Sometimes I get conflicts with forest. % specification for all trees, "default preamble" appends to existing specification. % The version with apostrophe replaces it. % where several trees have to be aligned with respect to their center. 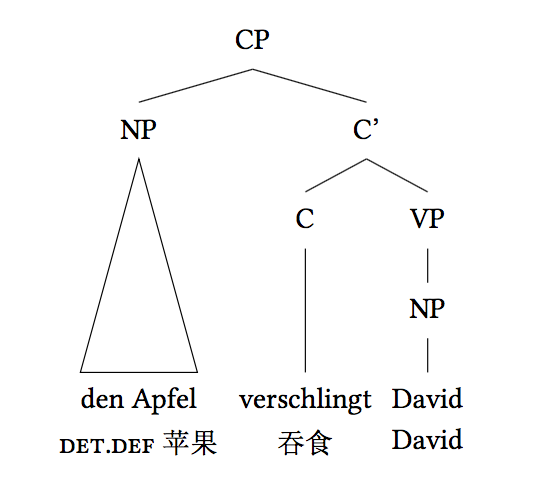 % ",delay=with translation" at the leaves is important to make this work. The reason your Chinese example doesn't work with pdfLaTeX is because your \gettext parsing macros can't deal with the way the Chinese characters are encoded in the input file. To preserve those macros you really need to use an engine that uses native UTF-8 input like XeLaTeX or LuaLaTeX. Not the answer you're looking for? Browse other questions tagged forest linguistics cjk chinese or ask your own question.